Oceania is a region of the South Pacific Ocean that consists of many different island groups. It covers an area of more than 3.3 million square miles (8.5 million sq km). 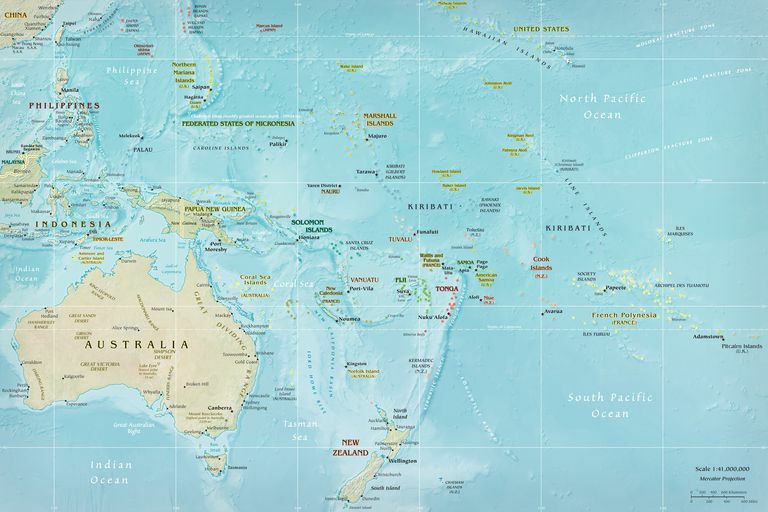 The island groups within Oceania are both countries and dependencies or territories of other foreign nations. There are 14 countries within Oceania, and they range in size from the very large, such as Australia (which is both a continent and a country), to the very small, like Nauru. But like any landmass on earth, these islands are changing constantly, with the tiniest at risk of disappearing entirely due to rising waters. The following is a list of Oceania's 14 different countries arranged by land area from the largest to the smallest. All information in the list was obtained from the CIA World Factbook. Even though the continent of​ Australia has the most species of marsupials, they originated in South America, back when the continents were the landmass of Gondwana. Ulawun, one of Papua New Guinea's volcanoes, has been deemed a Decade Volcano by the International Association of Volcanology and Chemistry of the Earth's Interior (IAVCEI). 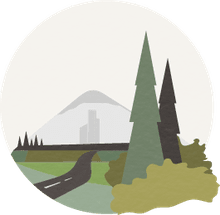 Decade volcanoes are those that are historically destructive and close to populated areas, so they merit intensive study, according to the IAVCEI. The larger island of New Zealand, South Island, is the 14th largest island in the world. North Island, though, is where about 75 percent of the population lives. The Solomon Islands contain more than 1,000 islands in the archipelago, and some of the nastiest ​fighting of World War II occurred there. Fiji has an ocean tropical climate; average high temperatures there range from 80 to 89 F, and lows span 65 to 75 F.
Sixty-five of Vanuatu's 80 islands are inhabited, and about 75 percent of the population lives in rural areas. Western Samoa gained its independence in 1962, the first in Polynesia to do so in the 20th century. The country officially dropped "Western" from its name in 1997. Kiribati used to be called The Gilbert Islands when it was under the dominion of the British. Upon its full independence in 1979 (it had been granted self-rule in 1971), the country changed its name. Tonga was devastated by Tropical Cyclone Gita, a category 4 hurricane, the biggest storm ever to hit it, in February 2018. The country is home to about 106,000 people on 45 of 171 islands. Early estimates suggested that 75 percent of homes in the capital (population about 25,000) were destroyed. Micronesia's archipelago has four main groups among its 607 islands. Most people live ​in the coastal areas of the high islands; the mountainous interiors are largely uninhabited. The Palau coral reefs are under study for their ability to withstand ocean acidification caused by climate change. The Marshall Islands contain historically significant World War II battlegrounds, and Bikini and Enewetak islands are where atomic bomb testing took place in the 1940s and 1950s. Rain catchment and wells provide the low-elevation island's only potable water. Capital: No capital; the government offices are in the Yaren District. Extensive mining of phosphate has made 90 percent of Nauru unsuited to agriculture. Although the whole world is feeling the effects of climate change, the people dwelling on the small islands of Oceania do have something serious and imminent to worry about: the complete loss of their homes. Eventually, entire islands could be consumed by the expanding sea. What sounds like tiny changes in the sea level, often talked about in inches or millimeters, is very real to these islands and the people who live there (as well as the U.S. military installations there) because the warmer, expanding oceans have more devastating storms and storm surges, more flooding, and more erosion. It's not just that the water comes a few inches higher on the beach. Higher tides and more flooding can mean more saltwater in freshwater aquifers, more homes destroyed, and more saltwater reaching agricultural areas, with the potential to ruin the soil for growing crops. Some of the smallest Oceania islands, such as Kiribati (mean elevation, 6.5 feet), Tuvalu (highest point, 16.4 feet), and the Marshall Islands (highest point, 46 feet)], are not that many feet above sea level, so even a small rise can have dramatic effects. Five small, low-lying Solomon Islands have already been submerged, and six more have had entire villages swept out to sea or lost habitable land. The largest countries may not see ​the devastation on such a scale as quickly as the smallest, but all of the Oceania countries have a considerable amount of coastline to consider.